3. Fantasy Geopolitics - anyone want to trade? Study for Monday's Africa Exam. 2. Continue work on the Africa Study Guide (handout HERE). You're using your Africa Study Guide to study for your Africa Exam on Monday, 11/3. Big Hero 6 at the El Capitan Theatre in Hollywood, Fri, 11/14 - Family Event! Share the Thank You Thursday message you wrote today with someone close to you. 1. Take out your Composition Book and a pen/pencil. You will need it to finish African Proverbs. 2. Finish African Proverbs - handout HERE - Today you will finish the discussion we began as a class yesterday. We already read and discussed proverbs #1-10 yesterday. Today, begin by silently reading #11-20. Pause and reflect on each one. Underline one or two that really speak to you. Share with your table group, and then share as a class. What do you think these proverbs mean? Continue this with #21-30. Then #31-40. Then #41-52. See if you can figure out which of these are Mr. Ippolito's favorites (he has three favorites, and he will share that with you tomorrow). 3. Begin work on the Africa Study Guide (handout HERE). You may need a textbook for this, so there are a couple at each table group. Share the African Proverbs we studied yesterday and today with your family. Ask a family member to identify 2-3 proverbs that are most meaningful to them. Have him or her explain to you what the meaning is of each proverb they chose. How can these apply to your family? Which is better: to have a story written down or to have a story told to you? Why? What are the advantages of having information written down (by hand or electronically)? What are the advantages/disadvantages of having information in spoken form only (in person, over the phone, in video)? How do you learn better: when you SEE WORDS on a page/screen, or when you HEAR WORDS with your ears? 1. What is a griot? Share the African Proverbs we studied today with your family. Ask a family member to identify 2-3 proverbs that are most meaningful to them. Have him or her explain to you what the meaning is of each proverb they chose. How can these apply to your family? 2. Prepare for the Draft - I will call team captains up to my desk to register for the Fantasy Geopolitics Draft. Please bring all your team's paperwork up to Mr. Ippolito at this time. 3. The Draft - A draft order will be established, and the first round will begin. Second and third rounds will follow immediately after. Be prepared with the names of the countries you would like to choose, plus a few back-ups in case your first choice is taken. Be prepared! 4. Big Hero 6 at the El Capitan Theatre in Hollywood - Family Event! This week is Red Ribbon Week. Continue to follow your country online in Fantasy Geopolitics! You may participate in the Hour of Code - CLICK HERE and click on the red GO button. If you choose to play the intro videos with sound, please use headphones or earbuds. When you complete your Hour of Code, you may print your certificate and then show it (or simply show your Chromebook screen) to Mr. Ippolito or Mr. Carranza to receive credit for today. OR, you may also choose to continue researching countries for Fantasy Geopolitics. If you choose this option, you will need to show Mr. Ippolito or Mr. Carranza proof of what you have worked on this period. 2. Submit your Team Name - Team Captains, please CLICK THIS LINK if you still have not yet submitted your Team Name. Today is also the deadline if you wish to change your Team Name. 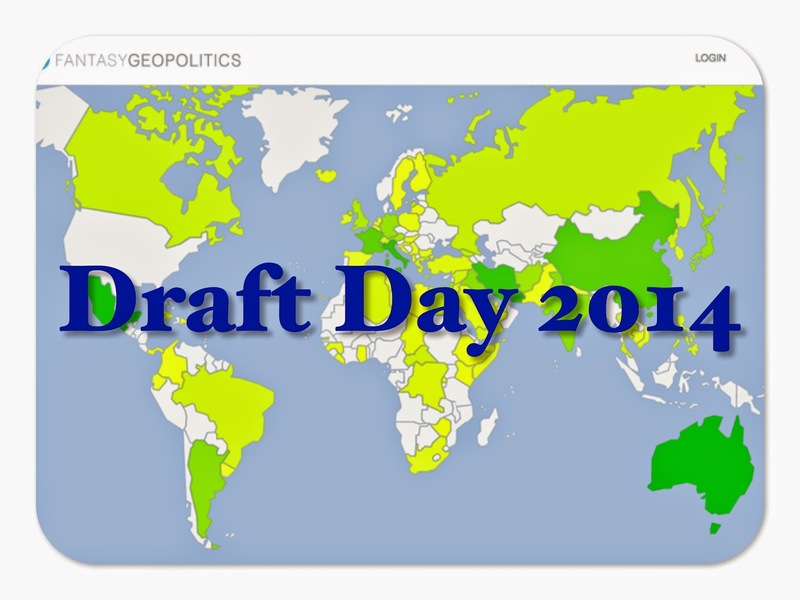 The Fantasy Geopolitics Draft is MONDAY. Continue researching countries for our Fantasy Geopolitics Draft. Please bring earbuds or headphones TOMORROW. Continue researching countries for our Fantasy Geopolitics League. The country draft will take place on Monday! Yesterday we were playing a review game in class to go over some of the vocabulary terms we had just learned on Monday night. I was puzzled when a number of students placed the Nile River in West Africa. Surely they must know their east from their west! 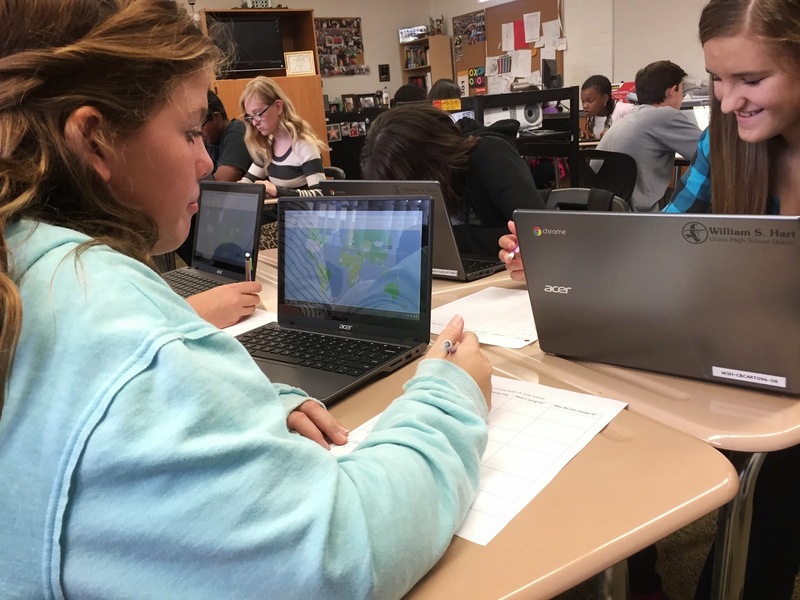 Surely they learned all about the Nile River last year in sixth grade social studies and know it is in the northeast corner of the continent! I had a small crisis on my hands, and decided we needed to do something about it. 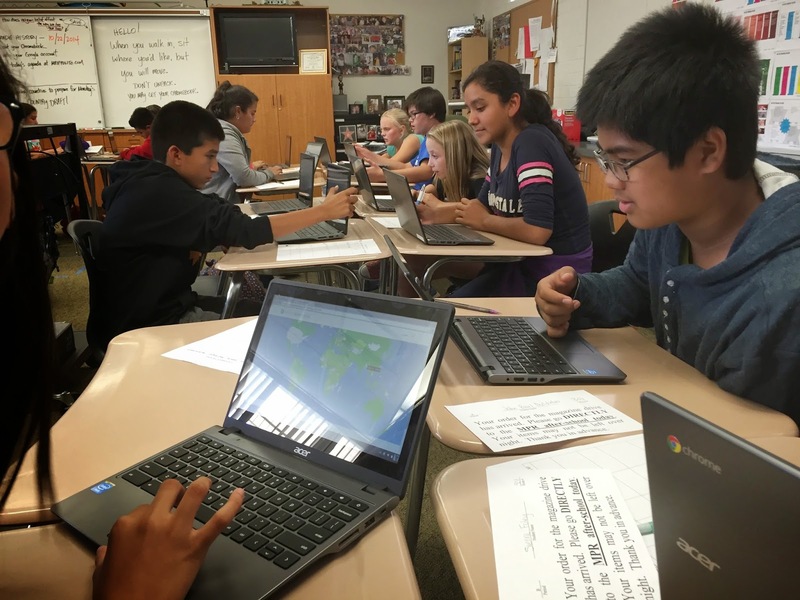 I had recently learned about an online game created by a social studies teacher called Fantasy Geopolitics. 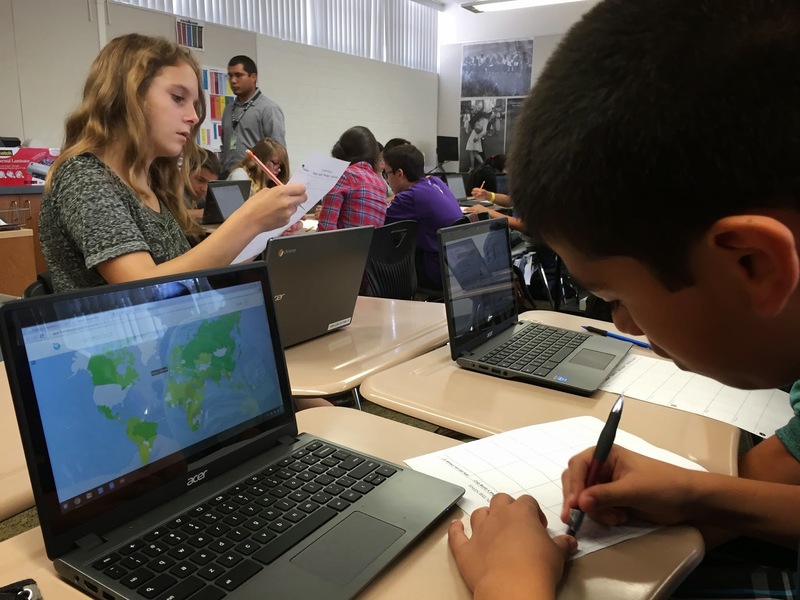 It plays a lot like Fantasy Football, but instead of drafting NFL players, students draft countries. Their countries then earn "points" based on how frequently they appear in the news, and how those countries seek positive interactions with other countries. Students were reading news stories, discussing strategy, and predicting what might happen in the coming weeks. Some asked questions like, "What continent is Australia on?" (hint: Australia is the only country that is also its own continent). Others asked questions like, "Where do you think the Ebola virus will spread next?" and "What do you think Russia's next move is going to be?" Some of my seventh graders were asking pretty sophisticated questions. In our next class, students will have an opportunity to choose team captains and team names. The "draft" will take place on Monday, October 27. 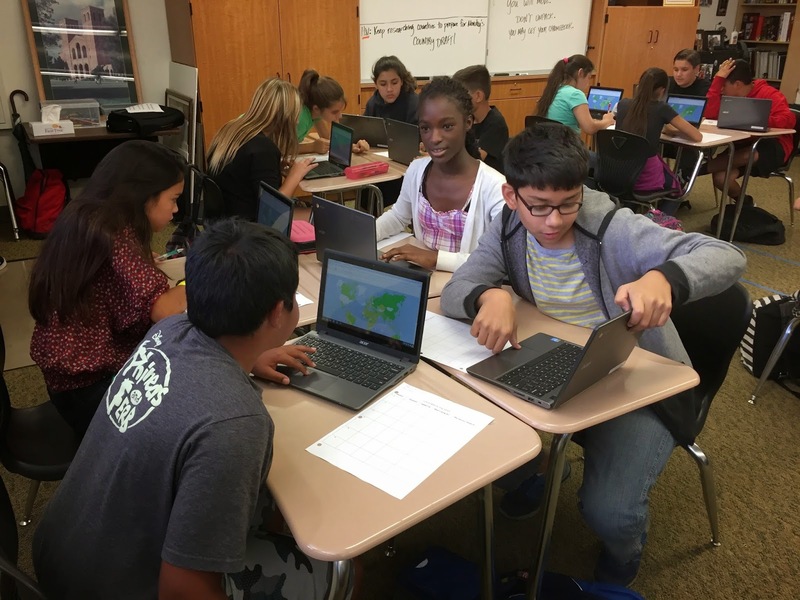 Learning geography and current events has never been more fun, engaging, and relevant! Mr. Ippolito will be performing on stage TOMORROW at lunch. It's the great Lip Sync Battle with Mr. Harper! Seating Chart - The Q2 seating chart will take effect tomorrow. 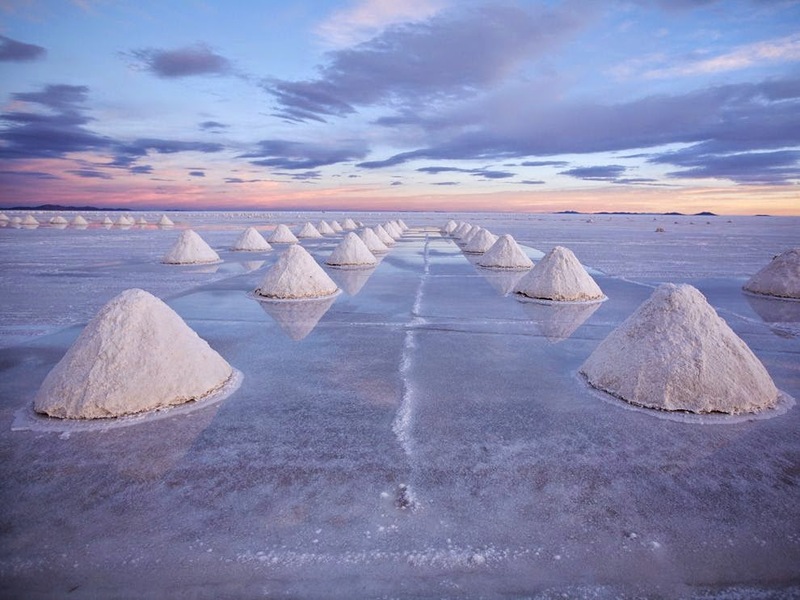 Ask your family members what they know about the importance of salt to humans and to human history. 5. Above and Beyond opportunities for Q2 - Make sure to check out the fun new activities this quarter! Please bring headphones this week; you will need them on Friday for a special activity. 6. Take a few minutes to log into Infinite Campus. You should verify that the grade you are getting in my class is accurate. If not, you should inform Mr. Ippolito TODAY. 7. Seating Chart - The Q2 seating chart will take effect by Wednesday. Mr. Ippolito will be performing on stage this Wednesday at lunch. It's the great Lip Sync Battle with Mr. Harper! At home, using context clues, define these terms. 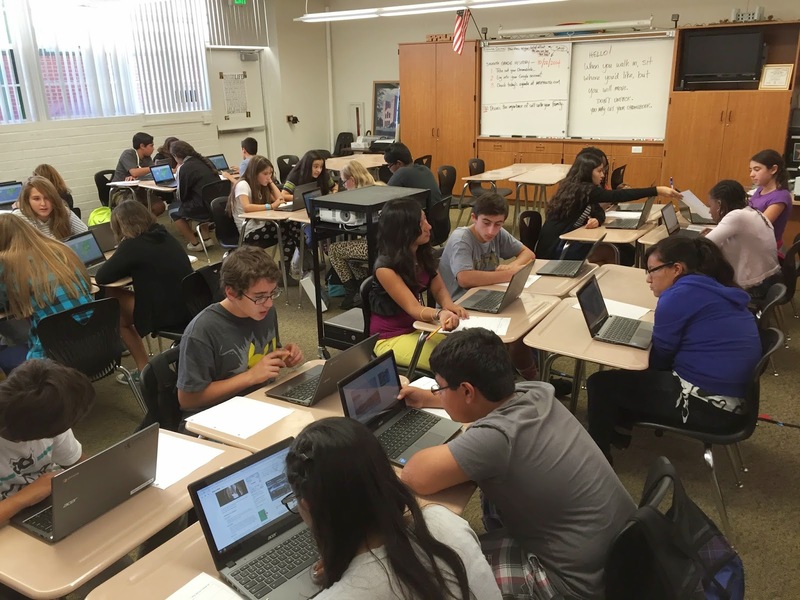 Use a Google Image search to help you better understand the meaning of each term. To take the Q1 Exam, click HERE. Be helpful around the house this weekend. 2. Review BC, BCE, CE, AD, and centuries - watch this video again. It will help with questions 19 and 20 in the Study Guide. 3. Take out your Study Guide. Need to look at a digital copy? It's HERE. To help you with your final study, rather than picking a couple standards and just giving you detailed answers to those, I have decided to give you ALL the answers. Well, at least where to find all the answers. Just go to the Awesome Learning Guide. 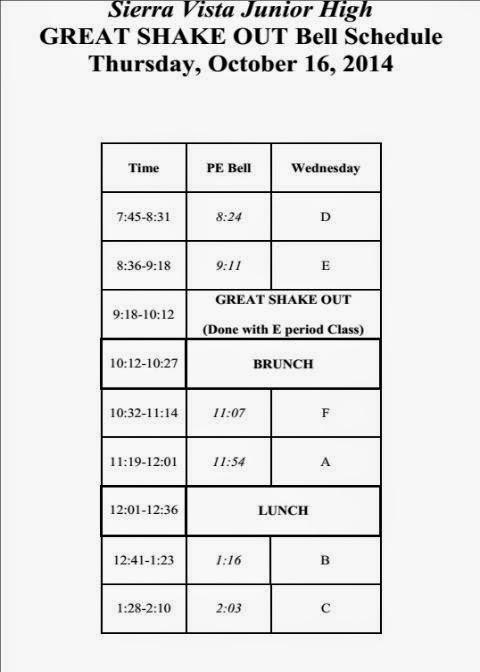 The Great Shake-Out is today during E Period. E Period, please make sure there is a #2 pencil in your backpack at the BEGINNING of the period. In my class, once you are finished with the Great Shake Out assignment, you should plan to bring a RELAX book out to the field, or something else quiet to do. According to school rules, no student is allowed to have any electronic distractions (headphones, video game players, cell phones, etc) out during the drill. In an actual emergency, you will need to be alert and be able to hear instructions given at a moment's notice. The Q1 Final Exam is tomorrow, Friday, October 17. Your presence tomorrow is very important. Study Guides were handed out last Friday. Need another copy? It's HERE. The Exam will be offered Monday (10/20) at lunch for anyone absent tomorrow. Study for tomorrow's Q1 Exam. Where do I find all the Q1 Study Guide answers? Do I have a treat for you! All the answers (well, at least where you can find all the answers). I'm helping you to help yourself. Seek, and ye shall find. Make it happen! The First Quarter of the school year ends this Friday, October 17, so we are quickly approaching the end of the quarter grading period, when the first permanent grades will be posted to your child's transcript. There will be an End-of-Quarter Exam this Friday, and it will cover ALL material we have learned in the last nine weeks. You can see all that we've learned by logging on to MrIppolito.com and clicking on the Awesome Learning Guide tab. Our website is rich with resources and information, including all the study resources your child needs for Friday's exam (Awesome Learning Guide). Ask your child to navigate you through our classroom website. We use it everyday. I am working very hard to transition your child from the world of elementary school to the rigors and challenges of junior high school, and beyond. We are working on being independent learners, seeking answers for ourselves, and scholarly behavior. I'm also trying to help them to become their own problem solvers when it comes to grades, giving them access to Infinite Campus on a regular basis, and helping them to be more comfortable with technology. 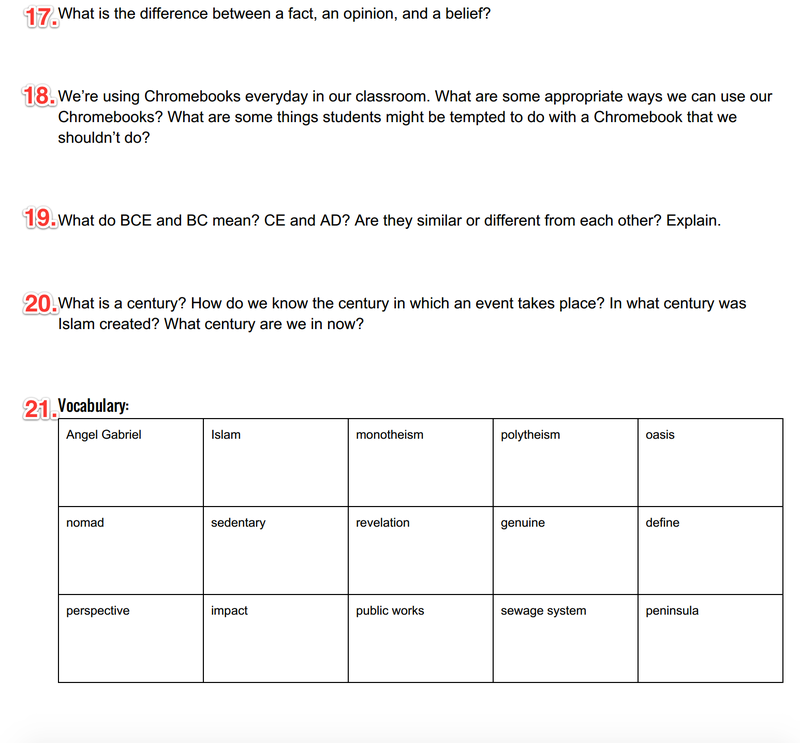 As I have mentioned to you before, we use Google Chromebooks daily in my classroom. What you see on MrIppolito.com is exactly what they see when they open their devices each day in class. Some children are flourishing in this environment, and some are still adjusting to the greater responsibility being placed on them. Learning how to navigate different classes, how to adjust to different teaching styles of six different teachers, how to handle greater personal and academic freedoms, coupled with all the changes that come with adolescence can sometimes leave kids feeling overwhelmed. Please continue to have daily conversations with your child about school, what they're learning, and how they are doing--academically, socially, and emotionally. I will continue challenging your child to learn and grow in a safe and nurturing environment. Read the text. Underline any challenging words (academic vocabulary words). Look those words up in Google as you read. The easiest way is to use the DEFINE search operator. DEFINE PHENOMENON or DEFINE SUBSIDE. 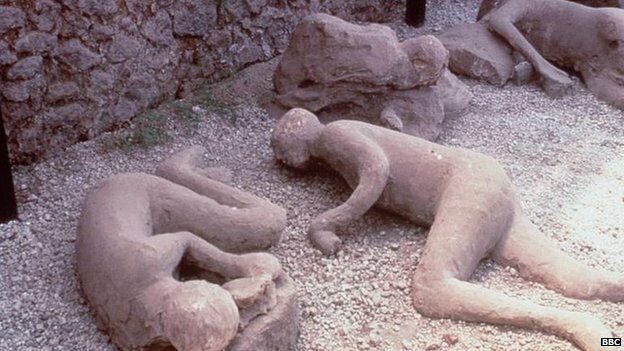 Imagine you are living in Pompeii at the time of the eruption of Mount Vesuvius. What do you think that felt like? Why do you think Pliny the Younger survived, while his uncle, Pliny the Elder, did not? Is the YouTube video a primary source or a secondary source? How about the reading? 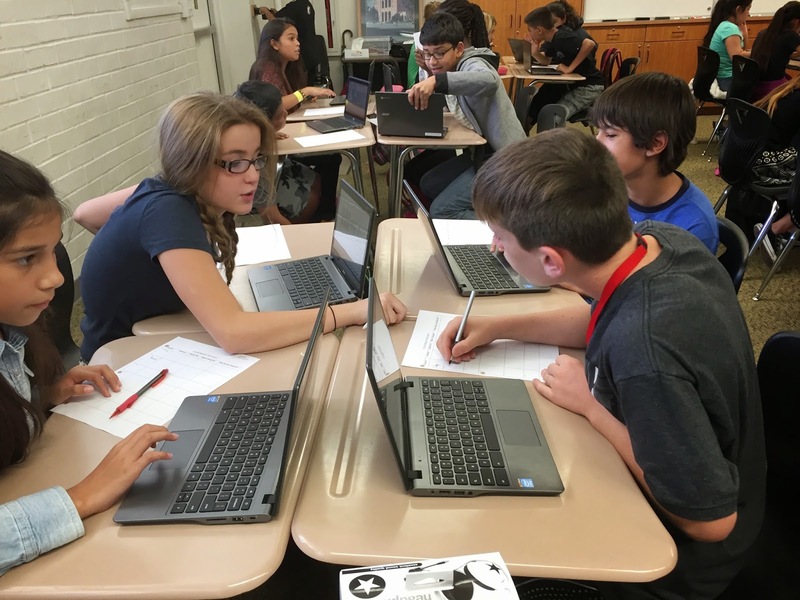 Is it a primary or secondary source? 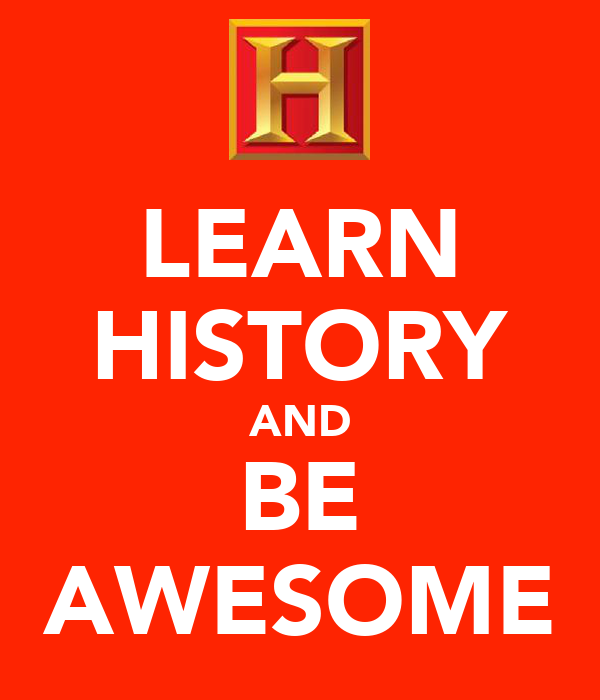 What is better to use for history--primary or secondary sources? 2. Take out your Study Guide. Need to look at a digital copy? It's HERE. We will go over the questions that were most requested yesterday. If we don't get to this today, we will finish tomorrow. The Great Shake-Out is tomorrow during E Period. You'll be outside for an hour. Check the weather and dress accordingly. The last opportunity for re-takes is today, 10/15, by 3:15 p.m. The Q1 Final Exam is next Friday, October 17. Your presence next Friday is very important. Study Guides were handed last Friday. Need another copy? It's HERE. The Exam will be offered Wednesday (10/15) at lunch and Monday (10/20) at lunch for those will be absent on Friday. Read "The Destruction of Pompeii--Wrath of the Gods" this time out loud to a family member. This Thursday is the Great Shake-Out, a big emergency disaster preparedness drill all across California. If you could go back in time and create an emergency plan for the people of Pompeii, what advice would you give them? Don't just say, "Hey, don't live below a volcano. Duh." The fact is, we live in earthquake country. Others live where there are hurricanes or tornadoes or massive snowstorms. Most Americans live where some form of natural disaster could occur, and you can't just tell them to simply "not live there." The point is to be prepared for when disaster does happen. So, what plan would you create for the families of Pompeii? Study for your Q1 Exam. 1. Take out your Study Guide. Need to look at a digital copy? It's HERE. If you lost your paper copy, NO WORRIES. You can still do your work today by looking at the digital copy on your Chromebook and answering questions by hand in your Composition Book. Start at the top and number each question going down the first page, then flip over to the second page. You should end with the vocab at the end being number 21. 3. Get into groups of 1's, 2's, or 3's. For each group, decide for yourselves which of all these questions on the Study Guide are the THREE MOST CHALLENGING QUESTIONS. 4. Now that you have chosen your three questions, spend about 10-15 minutes doing your best work answering them. There's no sense spending a lot of time on easy questions. Focus on the challenging ones. 5. Fill out today's Class Survey. 6. Get started on TONIGHT'S HOMEWORK, if you have time. The last opportunity for re-takes is tomorrow, 10/15, by 3:15 p.m.
Spooky Stories - Are you turning in a spooky story for the contest? The last day to turn them in to Mrs. Coleman is THIS FRIDAY. Read "The Destruction of Pompeii--Wrath of the Gods" once, silently to yourself. If the District Copy Center was successful, each student will get a paper copy of this article. Read the article again, this time out loud to a family member. 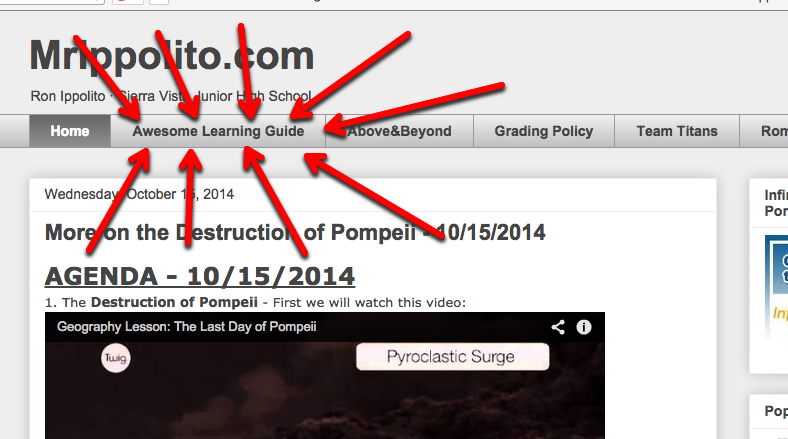 OPTIONAL: Watch this short YouTube video on Pompeii (we will watch it in class on Wednesday). Study Guides were handed out on Friday. Need another copy? It's HERE. 3. 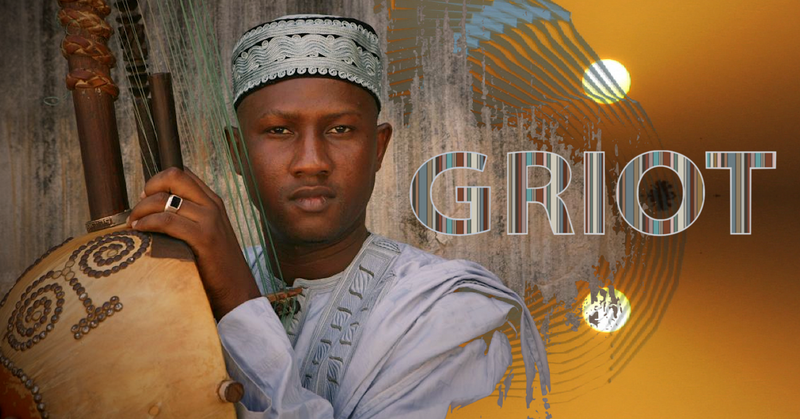 The Griot: West African Storytelling. 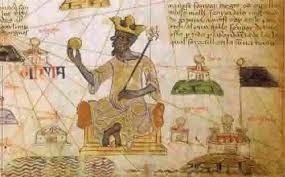 Today in the library you will get a special sneak-preview of our next unit ("Empires of West Africa")! Please be polite and attentive, and represent the best of Team Titans! Re-takes will be offered today (lunch and after school) and Wednesday (lunch and after school). The last opportunity for re-takes is Wednesday, 10/15, by 3:15 p.m. The last day of the quarter is next Friday, October 17. That will also be the day of the End-of-Quarter Final Exam. Your presence next Friday is very important. Continue to check Infinite Campus. Get your Study Guide today. We will review parts of the study guide a little each day over the next week. Need another copy? It's HERE. 2. Above and Beyond Projects - please write your name on the front board, whether you are presenting an Above and Beyond Project just to me or presenting to the whole class. Finish your Five Personal Pillars assignment. I want the final product to appear on paper. It's due TODAY (if you would like Mr. Ippolito to print it) or due MONDAY (if you are willing to print it yourself at home in color). Work on your Q1 Exam Study Guide. Re-takes will be offered today (lunch and after school), Monday (lunch and after school), and Wednesday (lunch and after school). 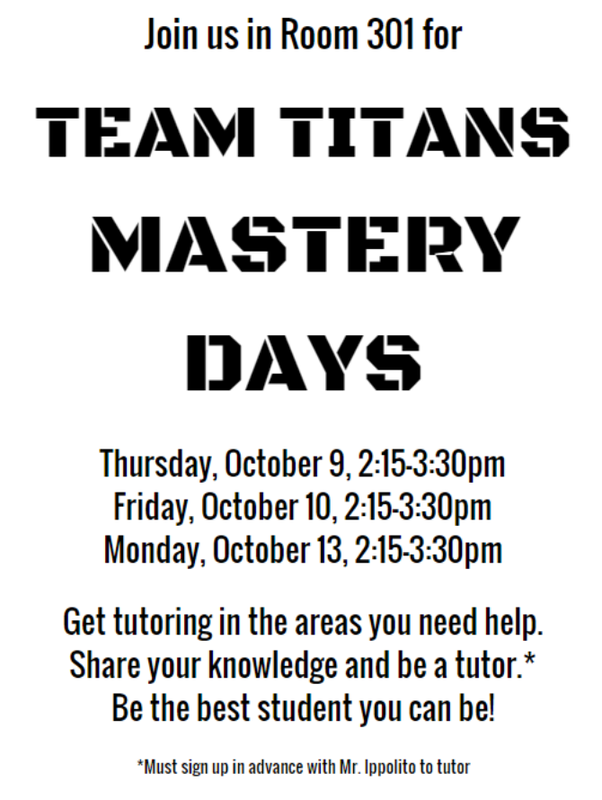 The last opportunity for re-takes is Wednesday, 10/15, by 3:15 p.m.
Mr. Ippolito and a group of helpful student tutors are offering after-school help in ALL subjects for all Team Titans students today and Monday, 2:15 to 3:30. 1. What is the Q1 Exam? What does the Q1 Exam mean to you? 2. Take a tour of the Awesome Learning Guide. Click the Awesome Learning Guide link at the top of MrIppolito.com. It's awesome, and can help you prepare for the Q1 Exam. Take a re-take, if you are ready. I will offer re-takes both today and tomorrow. If you don't know if you need a re-take, log into Infinite Campus and find out OR see Mr. Ippolito. If you need a re-take, and you aren't ready, you should get a copy of the re-take and use the Awesome Learning Guide and other resources to study for that re-take. Continue working on your Five Personal Pillars assignment. It must be done on paper. It's due TOMORROW (if you would like Mr. Ippolito to print it) or due MONDAY (if you are willing to print it yourself in color). that means you're done. The quiz is designed to give you feedback AS YOU ANSWER. It will not give you a final score at the end. These are examples of the types of questions you can expect on the Q1 Exam, so be prepared! Do something else productive to help yourself in this class, or in another class. 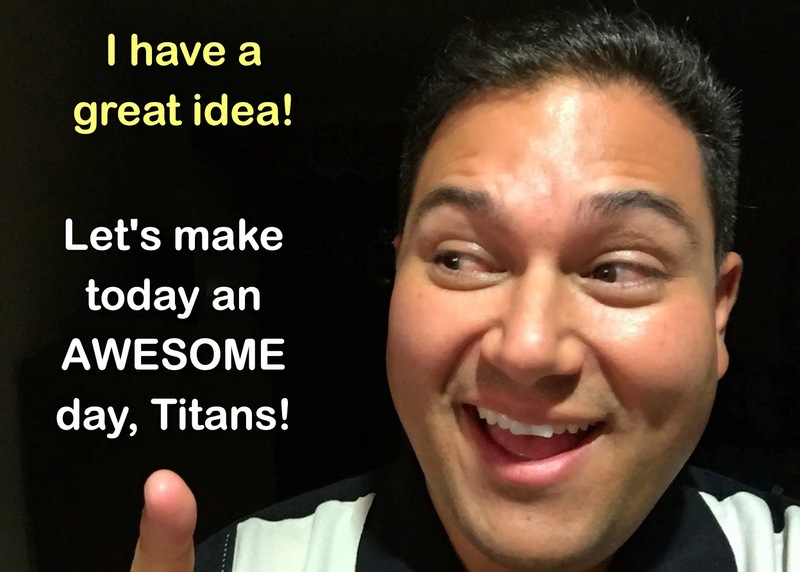 Mr. Ippolito will offer after-school help in ALL subjects for all Team Titans students today, tomorrow, and Monday, 2:15 to 3:30. If you are interested in offering tutoring today, tomorrow, or Monday, please see Mr. Ippolito. Above and Beyond credit is available. Come in for re-takes as needed. Complete those Above and Beyond Projects (most are due TOMORROW; you can do the Typing Test until next Wednesday, 10/15). 1. Take out your "Crash Course World History: Islam" Video Guide. Today we will go over questions 2, 3 and 6. 2. Iconoclast - What does it mean to be an iconoclast? 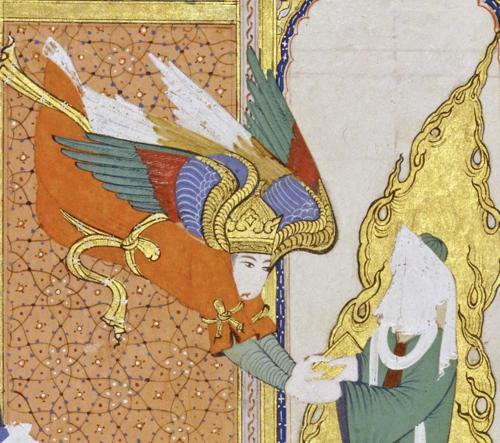 Was Muhammad an iconoclast? When can being an iconoclast be a good thing, and when can it be a dangerous thing? The following videos are from the Sundance Channel*, and are previews for their series called "Iconoclast." 3. 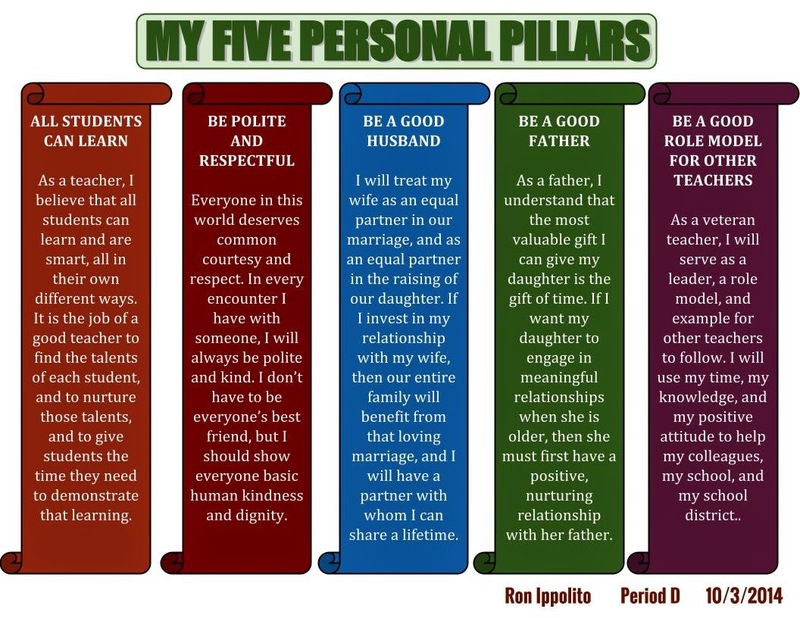 My Five Personal Pillars - Today you will continue to work on your Five Personal Pillars. We started this assignment on Friday. Mr. Ippolito will offer after-school help in ALL subjects for all Team Titans students tomorrow, Friday, and Monday, 2:15 to 3:30. If you are interested in offering tutoring tomorrow, Friday, or Monday, please see Mr. Ippolito. Above and Beyond credit is available. In-class re-takes are TOMORROW. In class. Please be prepared. Complete those Above and Beyond Projects (most are due this Friday; you can do the Typing Test until next Wednesday, 10/15). *The "Iconoclast" series is produced by a company called Grey Goose Entertainment. Mr. Ippolito does not endorse Grey Goose vodka, or underage drinking at all. Even though he is over 21, Mr. Ippolito thinks vodka is pretty disgusting. Yuck. 1. Take out your "Crash Course World History: Islam" Video Guide. Today we will go over Questions #1 and #5. We will start by watching this video reviewing Question #1. Did we already go over this question in your class? If so, please stick with me! This is so important to our current and future study of history that you NEED to know this! 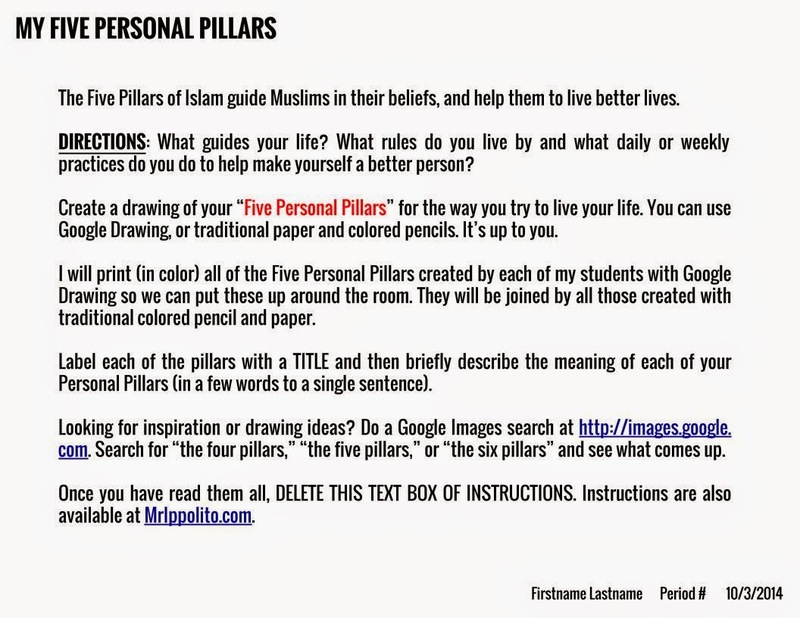 After reviewing Question #1, you will go over Question #5--the Five Pillars of Islam. There is a great video (aimed at slightly younger kids) here. You may or may not watch this as a class today, but feel free to watch it on your own time. It's very helpful, and they have cool British accents! I have created a sample here that you can look at. You'll notice that the first pillar I chose was a BELIEF (similar to the Muslim pillars) and then all the rest are ACTIONS (again, just the like the Muslim beliefs). Do you have to do it this way? No. But I challenged myself to do it because I like giving myself challenges. I have already created a Google Drawing template for you just for this assignment. I have correctly formatted the dimensions so they will print on regular 8-1/2 x 11 paper. Please use this template. How do I get to the template? The Google Drawing file I created for you should appear. It should be your name, followed by MY PERSONAL PILLARS. You can always just do this on plain white paper with colored pencils. That is a perfectly acceptable way to complete this assignment. This Five Pillars assignment will serve as an assessment of your understanding of this standard. This means that this will count toward your grade in my class. It is also a great assignment for examining your values, as well as those of your classmates. Above and Beyond deadlines - TODAY (10/3) to sign up online. NEXT FRIDAY (10/10) is the deadline to complete your project. I will allow Typing Tests up through Wednesday, 10/15. You do not need to sign up for the Typing Test Above-and-Beyond project. Simply do it in my classroom using typingtest.com and show it to me. See Above and Beyond for more info. In-class re-takes on ALL standards will happen NEXT THURSDAY, 10/9. In-class means you can study between now and then and do your re-take IN CLASS!! Use Fall Break to study and catch up so you are ready. The quarter ends FRIDAY, OCTOBER 17. These grades will be final and are entered into your permanent record. Know your grades in ALL CLASSES now. Over the four-day Fall Break Weekend, please, please, please check Infinite Campus to make sure you are on track to get the grades you think you should be getting in each of your classes. You have a chance for an in-class re-take on Thursday, October 9. Please use the time between now and then wisely, so you are ready for a re-take when it comes. 1. 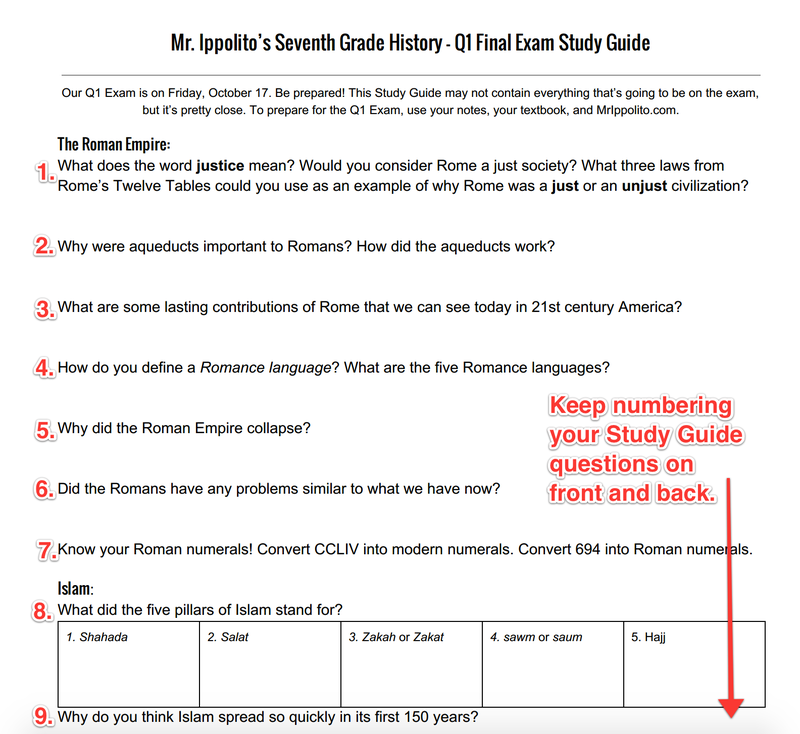 Check-In With Mr. Ippolito - Click HERE to take survey. 2. Kahoot Quiz! Go to http://kahoot.it and enter the code on the screen. Let's review context clues and our Islam vocabulary! 3. How to use Google Drawing - You will use this in class very soon! Above and Beyond deadlines - TOMORROW (10/3) to sign up. NEXT FRIDAY (10/10) is the deadline to complete your project. I will allow Typing Tests up through Wednesday, 10/15. You do not need to sign up for the Typing Test Above-and-Beyond project. Simply do it in my classroom using typingtest.com and show it to me. See Above and Beyond for more info. In-class re-takes on ALL standards NEXT THURSDAY, 10/9. In-class means you can study between now and then and do your re-take IN CLASS!! Use Fall Break to study and catch up so you are ready. The quarter ends FRIDAY, OCTOBER 17. These grades are final and are entered into your permanent record. 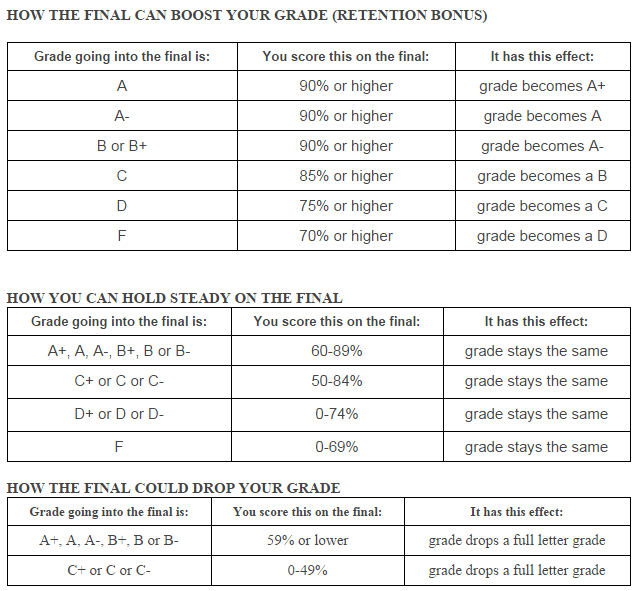 Know your grades in ALL CLASSES now. If you have access to a computer over the course of the day today, practice using Google Draw. It's one of the applications in Google Drive. If not, no worries! You will have time to play in class today, and again in the near future.